Cheats Pork Banh Mi Recipe - Easy + Delicious! 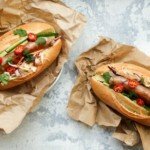 Cheats Pork Banh Mi Recipe - Easy + Delicious! The secret ingredient? Sausages! Get crunchy Vietnamese rolls on the table in no time with this easy Cheats Banh Mi recipe. Don’t like the sound of pickled coleslaw? That’s okay. Just skip this step and give your coleslaw a squeeze of lemon or lime and season with salt and pepper instead. Keep the kitchen clean and cook the sausages on the BBQ. If your hubby is anything like mine, he will end up cooking dinner rather than let you near the grill (and yes that was all part of my plan *cue evil laugh*). If you have leftover coleslaw mix and cucumber, don’t let them go to waste. Serve them with your Banh Mi as a side salad.